Karaoke may have originated in Japan, but America has turned this strange little public display of lyric reading, microphone wielding and awesomely bad singing into a national rite of passage. In fact, a rollicking night out with friends is usually not given the title of "epic" until a 3 a.m. rendition of Billy Joel&apos;s Glass Houses is involved. If American Idol has taught me anything, it&apos;s that we really like getting up on stage and losing our inhibitions through song--even if that means making complete fools out of ourselves. Karaoke is a way of life in urban music meccas like New York, Portland and Nashville, but Chicago has a great scene too. "Private Room" karaoke with comfy sofas, mini egg rolls and glow-in-the-dark tambourines. Need I say more? Or as I like to call it, the good ol&apos; VFDubs. Open until 4 am on Fridays and Saturdays, so you can sing "I Am Telling You I&apos;m Not Going" and really mean it. I rarely find myself in this area, but when I do, I&apos;m usually the only one eating a veggie burger and singing "Burning Down the House" at Blue Frog. Friday night karaoke at Shoes is always a good time. When you&apos;re not (ironically) belting Bon Jovi alongside trashed DePaulians, feel free to vandalize the walls with chalk or play darts while drinking some delicious craft beer. Another 4 a.m. dive with a cheap drinks, friendly staff and a cozy setup for singing/dancing the night away. This is my favorite gay bar for a reason. MaryOke! on top of Hamburger Mary&apos;s is the most fun I&apos;ve ever had with Wii, Giant Jenga and drag queens combined. Live band karaoke on Saturdays! And did I mention that they have the best thin-crust pizza in Chicago? Because they do. Okay, this place is Bachelorette Party central. It&apos;s also amazing: kitschy tiki bar atmosphere, drinks with names like "The Naked Jamaican" and over 10,000 karaoke songs for you to croon on a stage that has Christmas lights all-year-round. Seriously, what&apos;s not to love? 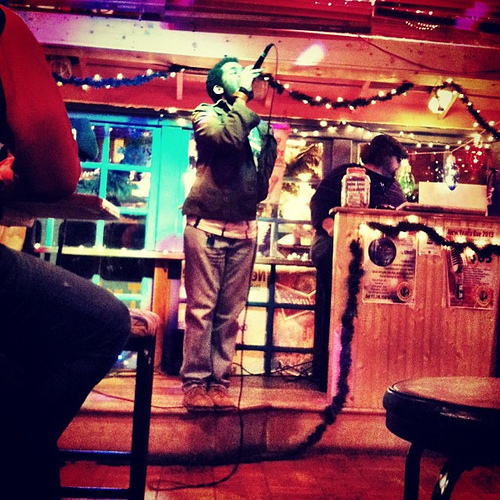 Where are your favorite places to karoake in Chicago? What about go-to songs? Sound off in the comments below or let me know what I&apos;m missing out on via Twitter @leahkpickett.